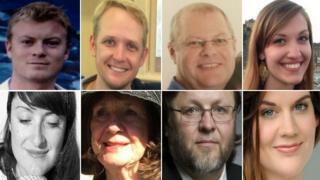 Germanwings plane crash: Who were the victims? Among the 150 passengers and crew on board the crashed Germanwings flight were babies, exchange students, two opera singers, football reporters and a Pentagon contractor. There were victims from 18 countries on board, although most were Spanish or German. Here are some of their stories. A group of 16 students, 14 girls and two boys, and two of their teachers, from Joseph-Koenig school in Haltern, western Germany, were travelling back from a Spanish exchange programme on the Germanwings flight. As many as 40 pupils had wanted to go on the trip and the school decided to hold a lottery to identify the 16 who would eventually go, local German media reported. Their Spanish counterparts had visited last year. A girl in the group nearly missed her flight after she forgot to bring her passport. She rang her host family who rushed 50km (30 miles) to the airport, delivering it just in time to allow the students to board the plane, according to the Spanish newspaper El Pais. Carol Friday, 68, was a nurse and her 29-year-old son Greig, an engineer. They were on holiday in Europe before Greig was due to start a teaching job. Their names were released by the foreign ministry in Australia, along with a statement from the family asking for privacy, according to ABC News. "Carol was a loving mother of two, a devoted wife to her husband, Dave, and a sister to three brothers," the statement said. Greig was to have turned 30 on 23 April. "He was a loving son to Carol and Dave and an exceptional brother to his sister, Alex. He was adored by all his family and friends." The small town of Sant Cugat del Valles near Barcelona is mourning the loss of six residents or local employees, among them three generations from the same family. Juan Padro lost his ex-wife in the crash. His daughter and granddaughter, both called Emma, also died. He told reporters in Barcelona: "There is nothing that can be done or that anyone can say, that changes the fact that I have lost such loved ones. "It makes no difference to me whether it was an accident or whatever. For me, I don't want to know. It doesn't interest me." Twelve-year-old Emma was the youngest member of the family to lose her life. She studied at a local middle school and been a member of a tennis club. Flags have been flying at half-mast in the town and a minute's silence has been held. Marina Bandres Lopez-Belio and her seven-month old son Julian Pracz-Bandres were on the flight, her husband has said. She is a Spanish citizen but had been a resident of Manchester for seven years. Marina was an editor and colourist in film and video post-production. Pawel Pracz said his wife and son were in Spain for her uncle's funeral. "She bought the tickets at the last moment, and decided to return to Manchester quickly as she wanted to return to her daily routine as soon as possible," he said. Originally from Hull, Paul, 28, was studying hospitality and hotel management at Cesar Ritz College in Lucerne, his family said. He had just finished his first year at the college and was on holiday with friends from Barcelona before flying back to the UK through Duesseldorf. Martyn Matthews, a 50-year-old from Wolverhampton, was a senior quality manager. He is thought to have been travelling to Germany for a business meeting. He leaves behind a wife, Sharon, and two children, Jade and Nathan. Maria Radner, 34, had performed in Richard Wagner's Siegfried at Barcelona's Gran Teatre del Liceu. The theatre said Radner, along with her husband and baby, were on the plane. Radner, who was born in Duesseldorf, had performed at the Metropolitan Opera in New York as well as in London and other locations, according to her biography on Italartist Austroconcert, a talent management company. Just before her death she was described as a rising star of Wagnerian opera. Oleg Bryjak, 54, was born in Kazakhstan and had performed in Paris, Zurich, London, Los Angeles and other cities, according to his website. The Gran Teatre del Liceu, where the two singers had finished their performances the night before the flight, offered condolences on Twitter. Little is known about the man who flew the plane for the first 20 minutes of its journey, but he has been named by German media as Patrick Sonderheimer. On Thursday it emerged he had gone to bathroom shortly after take off, leaving co-pilot Andreas Lubitz in charge of the aircraft. When he returned he found the cockpit door locked. Recordings show Mr Sonderheimer banged repeatedly on the door, in a vain attempt to regain access. Bild quoted security sources as saying that he then used an axe to try to break it down. French radio station Europe1 interviewed a former colleague of the captain, identified as Dieter. He said Mr Sonderheimer was married with two small children and was "one of our best pilots". "I'm 100% sure that he did everything he could," said Dieter. "I knew him very well... he was a very good man. He had a great sense of humour." The radio station did not name Mr Sonderheimer, but referred to him as "the commander" of the Airbus. Asmae Ouahhoud el Allaoui married her husband on Saturday in the north-eastern Spanish town of La Llagosta, local officials said. The pair were moving to Germany together. The man's name has not been released. Milad Eslami and Hossein Jawadi were journalists covering the Iranian national football team matches in Austria. They travelled to Spain for El Clasico - the match between Barcelona and Real Madrid. They were grounded at Barcelona airport, before getting on the Germanwings flight, as they did not have a return flight booked. Among three Americans to have died was Yvonne Selke, who worked as a contractor for the Pentagon's satellite mapping office. She was travelling with her adult daughter Emily. A family statement described them as "two wonderful, caring, amazing people who meant so much to so many". The third US citizen killed in the crash was named as Robert Oliver, a resident of Barcelona who worked for a clothing company. Maria del Pilar Tejada, and Luis Eduardo Medrano were among the victims, Colombia's ministry of foreign affairs confirmed. Tejada, 33, was studying at a university in Cologne. She had travelled to Barcelona to visit her partner, also a Colombian. Medrano, 36, was an architect travelling across Europe. He was someone with "an excellent sense of humour, sporty, very thoughtful, healthy and studious", and "a very good friend", Andres Agredo told El Tiempo newspaper in Colombia. Sebastian Gabriel Greco and Gabriela Lujan Maumus were both 28, Argentine media reported. Maumus was a bass player in a rock band and the daughter of a firefighter. She was scheduled to play this Sunday with her band Asalto al Parque Zoologico (APZOO) in the popular district of La Boca, Buenos Aires. Israel's foreign ministry has said 39-year-old Eyal Baum, who had been living in Barcelona, was travelling to Duesseldorf for work. His family in Hod HaSharon has been notified. A Flemish news site is reporting that a Belgian victim was 59-year-old Christian Driessens. He was reportedly born and raised in the Congo before coming to study in Mons. He met a Catalan girl there and moved to Spain. He was said to be living in Palleja near Barcelona. Christian Driessens has a goddaughter, Sandrine Driessens, from Liege. A Mexican woman who had lived in Barcelona for several years was on the plane. She was travelling to Cologne to attend a food technology fair, along with some of the other Catalan passengers. The Mexican government says two other citizens were among the passengers. Mexican media have named the victims as Daniela Ayon, Dora Isela Salas and Carles Milla, although their identities have not been officially confirmed. The Foreign Ministry in Tokyo identified the two Japanese passengers on board as Satoshi Nagata, a man in his 60s, and Junichi Sato, a man in his 40s.